The Kentucky Oaks (gr. I) name game is something fun that I've done on this blog for the last few years leading up to the Run for the Lilies. I research as many Oaks contenders as I can to find out their name meanings, and I usually get some pretty interesting stories! Following are some of the explanations I received on this year's stellar field of contenders. Which one is your favorite? She was named by B. Wayne Hughes' son-in-law, Eric Gustavson. Because she's such a pretty filly, her name refers to the saying, "Beauty is in the eye of the beholder." Rose to Gold races in the name of co-owner Raffaele Centofanti's wife, Kathy Amaya, and eldest son Raffaele, a standout defender on Stetson University's soccer team. Raffaele named the filly, with "Rose" referring to the past tense of the verb rise, rather than a flower or color. She is named after owner Barbara Banke's daughter, an equine enthusiast. "Both she and Katie (Banke's other daughter, for whom gr. 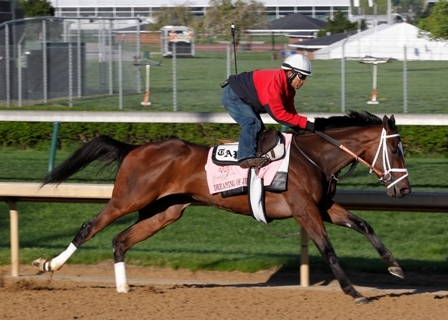 II winner Kauai Katie is named) are big horse racing fans," said Kentucky bloodstock agent John Moynihan. "They just love it." Her name refers to what owner Mike Repole regretfully told his wife about her spending limit for their new house. "The problem is that it was the first time someone gave her an unlimited budget and she actually went over," Repole continued with a laugh. "I made that mistake and those words will never be directed to my wife Maria again. Now we have a budget for everything. She's the only person I've known in history that's had an unlimited budget and has actually gone over." Co-owner Aron Wellman of Eclipse Thoroughbred Partners said other co-owner Tanourin Stable, from whom he bought a majority share in the filly after she broke her maiden, named her after a Venezuelan term. "The word 'silsa' means 'milky' in their native tongue," said Wellman. "Milky in Venezuela is a term for 'lucky.' They have a friend they think is always very lucky and they call him 'Silsa,' so they named her the feminine version of that, Silsita." Teddy Grimthorpe, European racing manager for owner/breeder Prince Khalid Abdullah's Juddmonte Farms, suggested the name for Close Hatches since her dam is Rising Tornado. It refers to the saying, "Close the hatches!" when a tornado is on its way. Her name, pronounced "Shaw-neen Girl," actually means "Irish Girl." She is named after one of the first horses trained by Canadian horseman Robert Tiller. "I was probably about 26 or 27 when I trained her, which was about 38 years ago," said Tiller of the original Seaneen Girl, a winning daughter of Seaneen, who won or placed in 24 of 27 starts from 1972-1974. 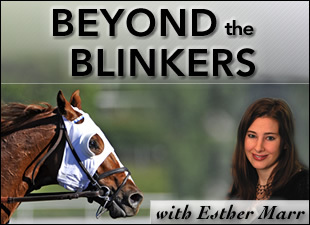 "I won a ton of races with her and loved her." Tiller bought the modern day Seaneen Girl for $5,000 at the 2011 Fasig-Tipton Kentucky fall yearling sale and raced her with Rolph Davis in her first five starts. She was acquired privately by trainer Bernie Flint and current owner Dr. Naveed Chowhan last fall. "I wish them well--they're good people," said Tiller. This filly was named by co-owner and New York resident Paul Edwards, who campaigns her in partnership with his brother, Peter; Neil Jessee, Dean Demaree; Steve McCulley; Rusty Jones; and trainer Kenny McPeek. "When we started talking about this horse...she's by Pure Prize and we said, 'We just want to have fun with this horse,' " remembered Peter Edwards. "And then my brother said, 'Well, let's just name her Pure Fun then. If we're gonna have fun, let's have 'Pure Fun.' And I said, 'That's perfect.' "